What sick man send babies to fight me! All was done in Photoshop CS42. Merging our threads together, I'm going to start posting my art here too. 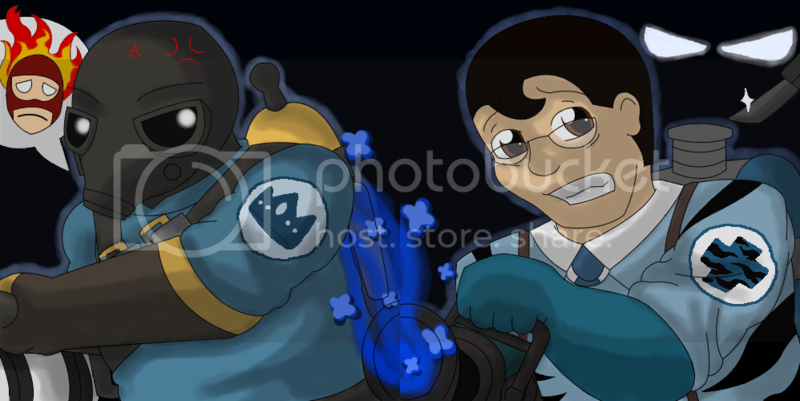 Made mine and Duke's new steam avatars, will soon be making one for Orange. Ignore that they don't align exaaactly.. I did them in two different canvases, derp. I'm normally not THAT unaware. quick duke hurry D: Tiger's gonna get stabbed! 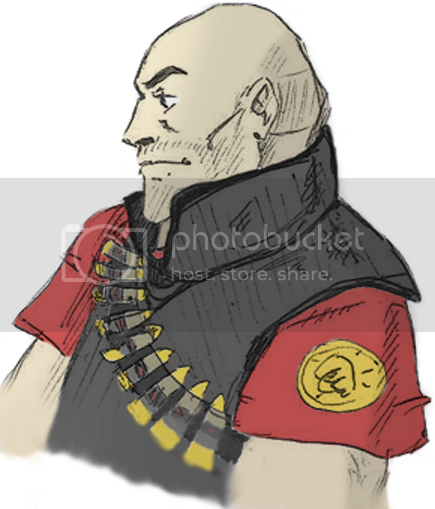 Seriously, is it just me or am I always the Spy behind every drawing that has a Medic on it? I was playing engi, when i heard con in the voicechat yelling somthing about " Oh god, I forgot that soldiers can fly! They look like demons!" Nice work, and yeah, it kinda does. 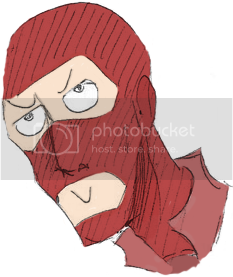 I'm pretty sure that at one time, Whale got on the roof of B as a soldier on the RED team and stopped me from sticky bombing the SG's inside as a BLU demoman on gravelpit. Why do I always have the thought I'm the thing behind things? Like me being behind this desk with a computer? 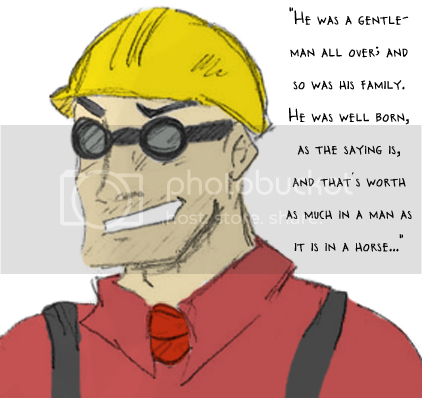 Engie, with a quote from a book that I enjoyed. I've yet to see one that could outsmart boolet. Bring it all together and you get..
Necrobumping this, I'm trying to find that rat medic picture that Javan made at the top of this thread. I don't have a copy! 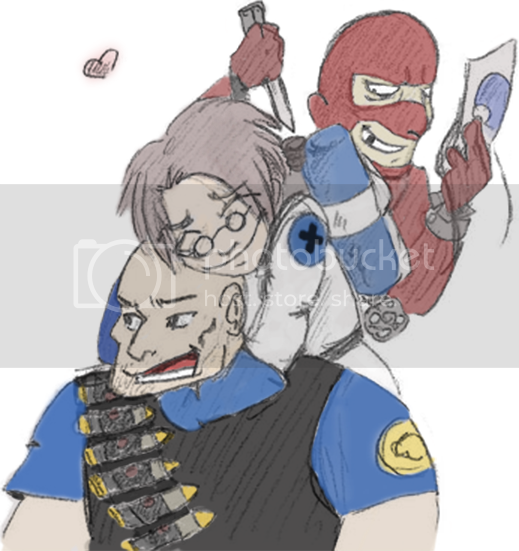 It was a anthro rat as a medic, holding an ubersaw. but Javan's deviantart page is gone now. deviantArt page has been flagged as inactive. Wayback apparently didn't play nicely with dA, so while their gallery page loaded, none of the images did. Also checked some other previously popular sites with no luck. 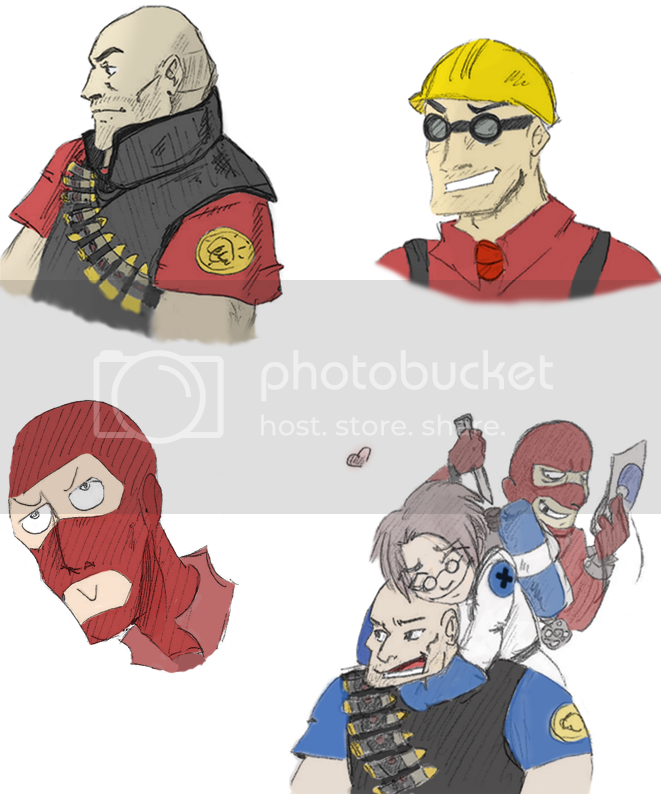 However, checking tf2chan and e621 leaves one slightly mentally scarred. I did find it hilarious that most instances of the word "ratty" was under adult fanfiction on the former. Of course, had to double-check that the file doesn't exist in the forum's uploads. It looks like it may have been lost around 24 Dec 2009, which was the last change time for similar files in that directory. I don't think they browse the forums anymore; you may want to hit them up on Steam (last online 15 days) and see if they exist. Thanks for trying. I guess the internet can forget!